Giuseppe Falcone first appears at Painesville, Lake County, Ohio, between 1917 and 1920. Giuseppe settled, and married, in Pennsylvania after immigrating to the United States. Mr. Falcone and his wife moved to Painesville before the birth of thier first child in 1920. In America, Giuseppe Falcone was known Joe Falcone. Giuseppe Falcone, son of Felicia Palma Falcone, was born on Sunday, March 31, 1895, at Roccacasale, Italy. He married Maria Ostoma, daughter of Felicia Santangelo, in 1915. Giuseppe died on October 24, 1968, at his home, 560 Williams Street, Painesville, Lake County, Ohio, at age 73. His body was interred at Riverside Cemetery at Painesville, Lake County, Ohio. Giuseppe Falcone immigrated to the United States on April 28, 1910, at age 15, travelling to Coraopolis, Pennsylvania. He immigrated to the United States at the Port of Philadelphia, Pennsylvania. Giuseppe registered for the military draft for World War One on June 5, 1917. He was living at Ambridge, Beaver County, Pennsylvania. Mr. Falcone became a citizen of the United States in 1928. He resided at 632 North State Street, Fairport Harbor, Lake County, Ohio, when he was naturalized. Giuseppe Falcone’s mother, Felicia Palma Falcone, immigrated to the United States in 1930, and lived with her son (and his family) until she passed away in 1941. Joe Falcone and his wife owned and operated a grocery store on North State Street from 1925 until 1963. 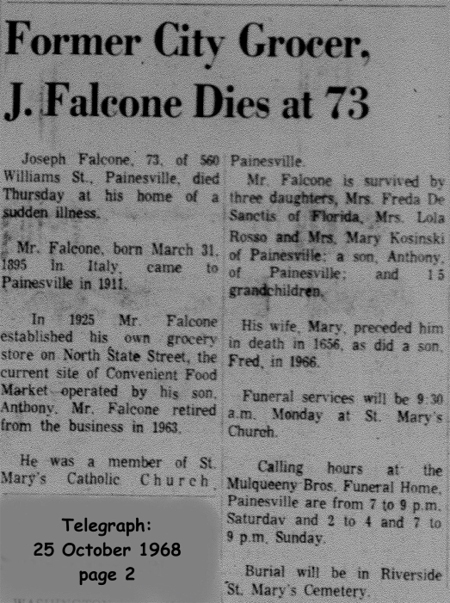 Mr. Falcone’s wife, Maria, preceded him in death in 1956. Giuseppe Falcone may have been related to Painesville Italian Guerino Falcone who lived in Fairport Harbor.